I have an quick and easy way to make any pie, tart, or cake look fancy: Pile a bunch of berries on top! That's what makes this otherwise ordinary cheesecake tart much more sophisticated, let alone colorful! Even though berries are more of a Summer fruit, somehow they work perfectly for Winter when you roll cranberries in sugar to make them "frosty". And with the addition of the mint leaves, it takes on a very Christmas-y look, don't you think? The foundation of this tart is a chocolate cookie crust. Sure, I could have made a plain old graham cracker crust, but chocolate seems so much more appropriate for the holidays. Plus, I am a sucker for chocolate and berries. It's one of my favorite flavor combinations! The next layer of the tart is my (aka my mom's) classic cheesecake batter. Because this tart is much thinner than the New York style cheesecake that I usually make, I only made a third of my usual recipe. 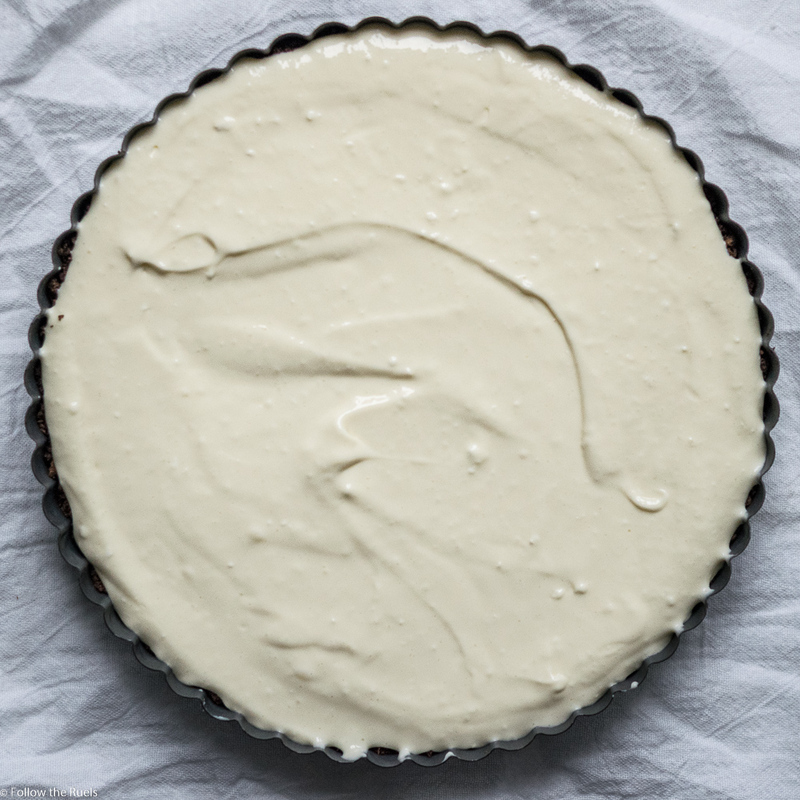 What's great about making cheesecake in a thin tart pan is that it bakes so much quicker. Cheesecake usually takes over an hour to bake. But this barely took 30 minutes. I made this just a few hours before I served it, which I would never do with my usual cheesecake recipe! While the cheesecake baked, I worked on sugaring my berries (why does that sound dirty?). I have never sugared cranberries before, so I turned this really helpful post. Well, it would have been more helpful if I had followed direction. Of course, I like to think I know what I am doing all the time, but sometimes I really don't. I skipped one pretty important step: letting the simple syrup dry before rolling them in the sugar. Whoops! Then, once the tart had chilled and I had added a layer of sweetened sour cream, I just piled the raspberries and cranberries right on top. There wasn't any rhyme or reason to it, clearly. But it still turned out so nice! I love the disorganized and rustic look of a pile of berries! One slice of this tart is the perfect bite of chocolate crust, rich cheesecake, and fresh berries. All the flavors were there and complimented each other wonderfully! 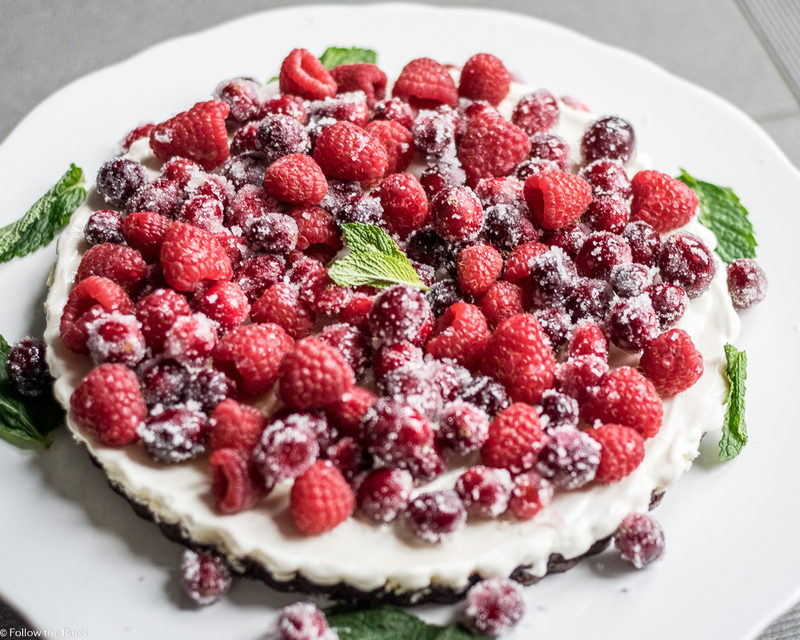 I also love the combination of the tart raspberries and crisp cranberries. Since the cranberries were soaked in simple syrup and rolled in sugar, they had a crunchy outer crust and were much sweeter than normal. They weren't overly sweet, which made them a perfect pairing for the super sweet cheesecake! You should probably make this cheesecake tart ASAP. It would be perfect for a holiday party. And you will want to make this while you can still easily get your hands on some fresh cranberries. But, if you don't want to make this now, you can make the same tart this Summer and pile on some strawberries, blueberries, or any one of your favorite fruits! Add the chocolate graham crackers to the work bowl of the a food processor. Process until cookies have been crushed into a find gravel-like consistency. While the processor is on low, pour in melted butter. The cookie crumbs should be slightly moist and stick together when pressed with your fingers. Pour the crumbs into a tart pan and use the bottom of a cup and/or your fingers to press down the crumbs to form a compact crust. Set aside. In a large bowl, beat together the cream cheese and sugar until light and fluffy. Mix in eggs, sour cream, and vanilla until smooth. Pour the batter into the tart shell until the batter almost reaches the top. Do not over fill. Wrap the bottom of the tart pan in aluminum foil, then place on a baking sheet. Pour in enough water to cover the surface of the baking sheet. Place in the oven and bake for 10 minutes. Then reduce the heat to 300 degrees and continue baking for another 20 to 25 minutes. Remove from the oven and allow to cool to room temperature, then transfer to the fridge to continue to chill. Meanwhile, in a small bowl, mix together the sour cream, sugar, and vanilla. Spread over the top of the cheesecake into a single, thin layer. Pile the cranberries and raspberries on top. Chill until ready to serve.